Welcome to this blog which is intended to accompany a website on how Suffolk was defended during the Second War. The blog will describe my trips out and about looking for the remains of the Second War defences while the Website will concentrate on putting these into context. 6 pdr anti-tank gun pit? I had an interesting couple of days around the Gunton / Corton area over the last two weekends. The defences remaining in this area are well known and along with those at Shingle Street to Boyton, must rank as one of the best preserved stretches of WW2 Defences along the Suffolk Coast. Having said that, the sheer amount of litter and rubbish in the area makes the walk at Shingle Street/Boyton much more pleasurable! This area more or less formed the northern boundary of Lowestoft’s defensive perimeter. The reason for this section of coast being so heavily defended was because of the port facilities at Lowestoft. The JC Plan, produced during the autumn of 1939, considered that any invasion during the winter of 1939/40 would not take place on beaches but that “A more likely course would be an attempt to enter a port with transports”. The plan identified The Humber and Harwich as the most likely ports to be seized by the enemy during an invasion, but noted that Aberdeen, Dundee, Lowestoft and Ramsgate were also likely targets. The importance of ports was also highlighted in GHQ Operating Instruction No 2 (11th June 1940), and ports were heavily defended during the course of the War. The Naval assessment of Landing beaches from Lowestoft-Yarmouth carried out in 1940 considered the beaches only suitable for landing infantry and light armoured fighting vehicles. 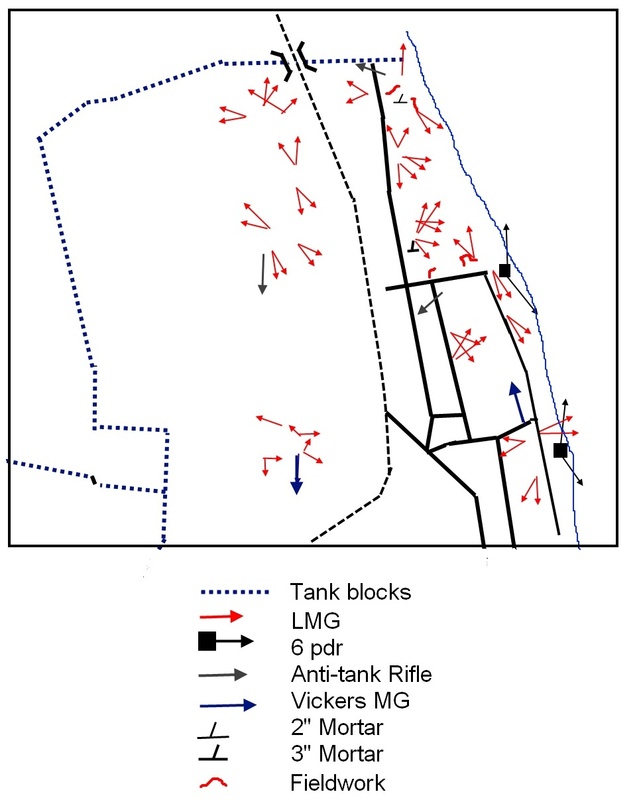 A seawall running 1 ½ miles north of Ness Point and sand cliffs at Gunton / Corton were considered as tank proof. The hinterland although was assessed as good tank country. Lowestoft was given an all round defended perimeter which as already stated the Gunton area formed the northern boundary. In the area today many pillboxes, two 6 pounder anti-tank gun emplacements and anti-tank blocks can still be seen. Above: Type 22, Golf course, almost buried! Above: "Suffolk Square" on the west side of the old railway line running along the Golf course. Above: Three of the "Suffolk Square" pillboxes that can be seen on the cliffs above the beach. Note that in the top image the embrasures have been blocked, the result of many pillboxes being deemed as not required by 1941. Above: Some of the defences along the old seawall that has now been undermined. Top - a small square pillbox built into the seawall. Bottom the remains of a "Suffolk Square" and the holdfast for a 6 pdr anti-tank gun. The position of the holdfast is confirmed by the map of the defences in the area attached to a Battalion War Diary and shown at the start of the post. Above: 42"x42"x42" tank cubes that ran along the northern edge of the defensive perimeter from Tramps Alley. Above: Two railway blocks, described as 'road' style blocks as opposed to waggon blocks. They consist of a 'fixed' portion outside the running line and a movable portion across the running line. In the top image the 'fixed' portion consists of one 3'6"x3'6"x4' block either side of the running line; the movable portion would have been rails, the concrete platform on which the sockets would have been set in can still be seen. On the bottom image the 'fixed' portion consists of two 5'x5'x5' blocks either side of the running line. Bottom - Location of Naval depth charge road crater obstacle - Ravine Score. Listed as incomplete as at Sept 1941. Above: Map from Battalion War Diary showing the rail road blocks (marked by a cross) and the road craters (marked by blue circle with red dot) shown above. Cart and Ravine Score are the roads either side of Bellevue Park. 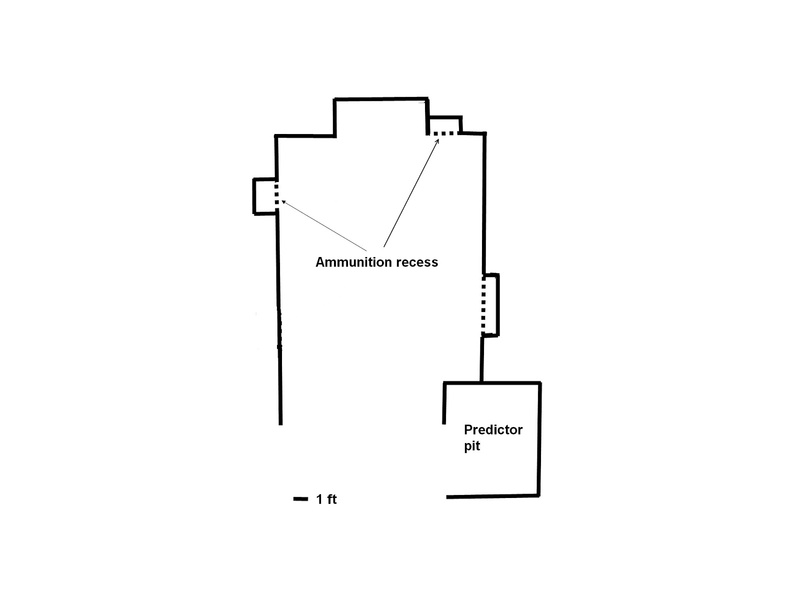 The second gun position consists of a holdfast with a concrete sandbagged wall. Presumably some sort of overhead protection would have been provided. The area was considered for Assault Landing Training in 1944 for units that would take part in D Day as part of Force L. Minefields were swept and cleared but just to make sure a Churchill tank was requested to run up and down the beach (with adequate protection for the crew with sandbags placed on the floor of the tank!). However in the end, the presence of underwater spikes, or “Dragon’s Teeth”, resulted in the beach not being used for Assault Landing Training. However some sort of training does seem to have occurred in the area, one pillbox has been blown up and another seems to show weapons damage to its embrasures. Above: Evidence of training in the area? Top image shows demolished "Suffolk Square" pillbox while the "Suffolk Square" in the bottom image seems to show weapon fire damage to the embrasures. A relic of so the called ‘Tip and Run’ raids in the form of a Bofors gun emplacement also survives. Lowestoft was one of many coastal towns along the south and east coasts provided with LAA defences against Tip and Run raids. Above: Top - The Bofors emplacement. 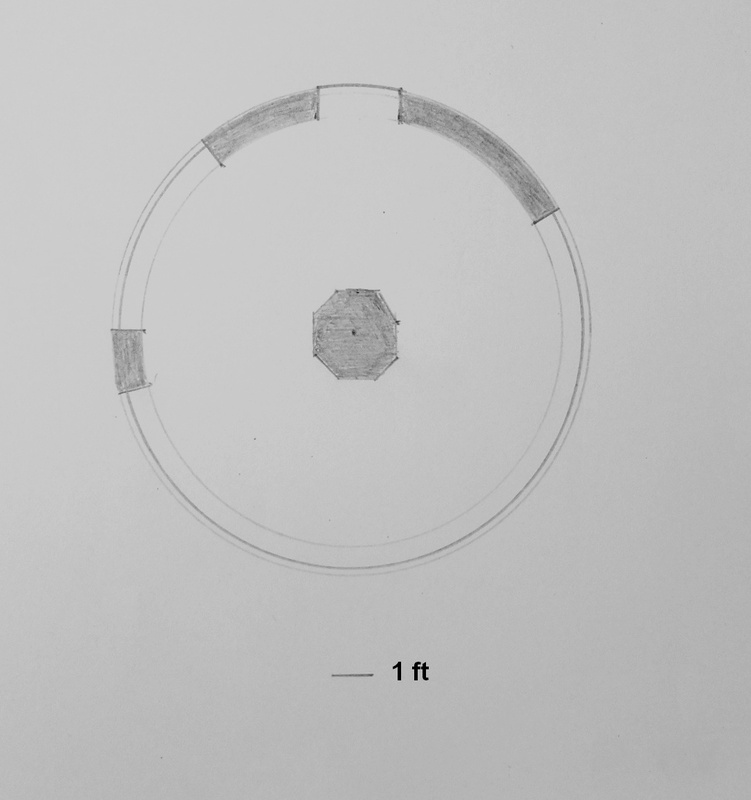 Bottom - plan of the emplacement; it is a slight modification of the official plan. It would have been surrounded by an earth bank, part of which still remains today.